Ripping, the process of transferring music from CD to digital format, has been around for consumers for a good ten or fifteen years. Early on in the digital music revolution it was pretty much the only way to listen to music digitally. Later on came downloading music, either via online stores such as iTunes or via P2P (peer to peer) networks. More recently, streaming music from services such as Spotify or Grooveshark has become possible. Yet ripping remains popular. Principally, ripping gives control over the digital music that is created from a CD. For instance, the quality of the resulting digital music file, and the format it is in, is up to you. 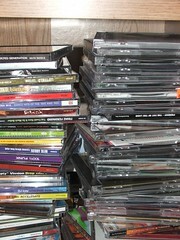 The music purchased from online stores is typically below CD quality, but with control over the ripping process the CD quality can be retained. For such reasons, ripping remains useful particularly for the discerning audiophile, or just anyone who wants more control. All audio formats can be grouped by whether they are lossy or lossless. The word 'loss' refers to whether any data is lost in the transfer from CD to digital music file. In lossy formats, some data is lost, with the aim of reducing the music file size as much as possible. The resulting data is also, normally, compressed. Lossless does not lose data, although the data may still be compressed. The dichotomy between loss and compression is suprising to some, but loss is really about choosing what data is needed to represent the music faithfully, while compression is really just about storing that data in as small a space as possible. Flexibility. This is the most important reason. Lossy music is a one-way street. Once the data is lost, it's lost, and there's no way of getting it back. This makes life difficult when, for instance, you purchase a new music player that plays different formats to those you've ripped to. With lossless, you can always convert. Better music quality. This one's arguable by some, that the differences between lossy music encoded at a high quality level and lossless is not audible. I have a feeling this depends on your listening equipment. For me, the evidence mounts that there is a difference, and I don't fancy re-ripping every track once I have a new hi-fi so I just rip to lossless and forget about it. Player support. Lossless formats are less well supported in mobile MP3 players. For these, you may find yourself converting from FLAC to MP3. Disk space used. Typically, a FLAC file will use around three or four times the space of a high quality MP3 file. I think these disadvantages are worth ripping to lossless, regardless. The inherent advantage of lossless is that you can convert to other formats, so player support is not a big problem. Secondly, storage is cheap and it's getting cheaper. 1TB drives, enough to store at least 3,000 albums in FLAC format, now cost around £40 ($64). That's just over 1p (a couple of cents) per album! The advantages of lossless audio formats outweigh the disadvantages. So where should you start? I would suggest the format you choose is FLAC. It compresses music for smaller file sizes while retaining lossless quality and is well supported by various music playback systems. Use CDex or Winamp on Windows, Max on the Mac and abcde on Linux. Ripping lossless is the best long term solution for CD ripping. Thanks to Monochrome for the image above.